We knew we were going to get some amazing and one of a kind portraits for Nick and Lauren's wedding. They had their ceremony at the Assumption Church in Buffalo. Photos were done at Park Country Club. And the reception was at Salvatore's Italian Gardens. I say one of a kind because Nick is the son of the owner of Salvatore's! They had two ballrooms blocked off for the reception. One was for cocktail and the other for dinner and dancing! When you have five hundred guests, you need all the space! Salvatore's was always known for having old cars in their windows. Everyone does photos outside to get them in the back ground. 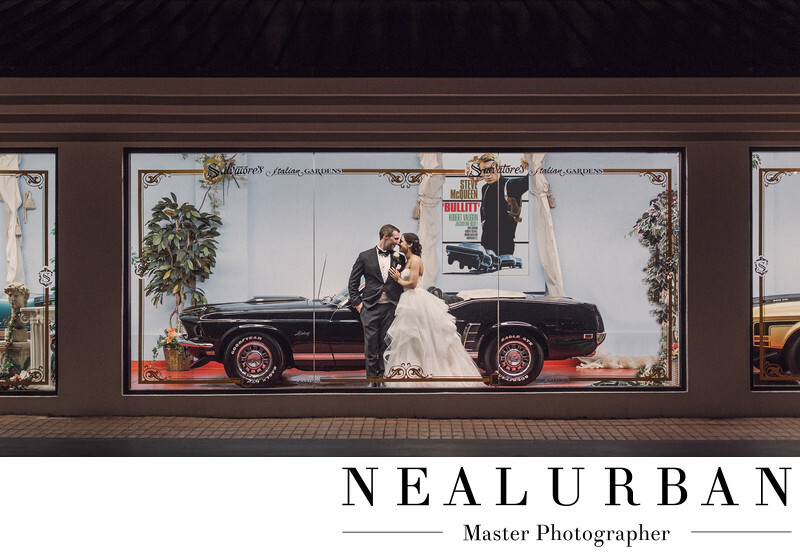 Well we asked if we could put the bride and groom in the window! Nick said no problem. Which cars do you want to use! Amazing! Another part to this story was Salvatore's was going to undergo a huge remodel. They were going to open The Delavan Hotel as part of the venue! That meant, these cars were not going to be there for much longer. There would be no windows. This is where the new hotel was going to be built. We were so happy that we were able to put Nick and Lauren here before it was demolished! So many people saw this image and asked us to do the same thing if there wedding was there. Unfortunately, this was not going to happen again! We created an amazing memory for the family with this image!